How to survive the zombie apocalypse: Follow our guide! 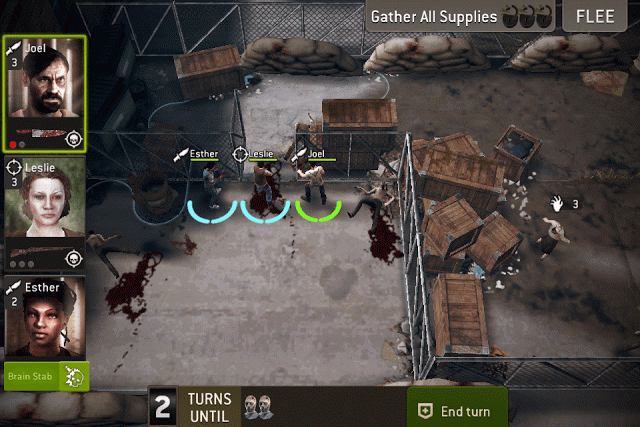 With The Walking Dead having returned to TV and plenty of other zombie media out there, it's the best time to go check out the iOS app The Walking Dead: No Man's Land for some turn-based tactical role-playing action. It's a pretty difficult game if you just enter it without any sort of strategies, so if you want to manage your survivors and get through zombie attacks with as many characters as possible, you're going to want to take this guide with you. Earning extra XP is integral to advancing in-game, so the more of it you have, the better off you're going to be. Each one of your survivors has his or her own special critical hit that they can use when they down 1 or 2 zombies. Activating these attacks will net you extra experience points, so make sure you use these moves when they do become available to you. There are several zombies that can likely be found at any moment wandering around your camp. You can take these walkers out by tapping on them as soon as you see a sniper scope pop up on-screen. Killing these zombies will get you a lot of goodies in the long run, even XP, food, or gas cans, all of which are infinitely valuable. Use specific classes of survivors against multiple walkers. Different survivors have different abilities that you can use to thin out the herd of zombies that'll descend upon you in-game. One smart move you can make is using a Hunter class survivor's sniper rifle to clear out crowds. You might accidentally end up attracting more zombies this way, but you'll also be able to take them out quicker, too. More muss, more fuss, but in the end there'll be fewer zombies, too. Every turn you have, make sure you outfit your survivors with the proper weapons and armor to keep them ready for anything that crops up. Upgraded weapons, for one, will net you special traits that you can earn several different unlocks from.